Fauquier Advances 11 in a thriller District Finals. As the final match ended at the 2013 Evergreen District tournament Fauquier finished in 2nd place with 161 points behind Brentsville who won the event with 162.5 points. Swallowing any defeat as the Falcons have all year, there are still many positives that Fauquier Nation should walk away with. Having 8 wrestlers in the finals and advancing 11 of 14 wrestlers to the Region II tournament, the most out of any team from the Evergreen District, should still show all that Fauquier traditions continue even during a rebuilding year. With three district champions, five runner-ups, three third placers, and one fourth place finisher the Falcons once again showed much class on the mat as their skill level pound for pound kept them on top of the leader board through 64 of the 66th wrestling bouts. In the end Brentsville finally was able to jump over Fauquier at the 195 pound final match by winning this bout. Congratulations needs to be given to Brentsville for winning the district tourney and to Kettle Run as they earn their first two districts champions ever. But, the many missed opportunities that Fauquier gave up seemed only fitting that their goal is unfinished; States. All the past seven district titles since 2006 Fauquier really had ownership of the first place trophy leading into the final round of those years. But that was not the case in this year’s 2013 district finals. Leading into the final round this year there were four teams that separated the lead with a small margin of 12 points. In the final round Fauquier had a lead with 149 points, Warren Co. had 144 points, Kettle Run had 138 points, and Brentsville was in fourth place with 137 points. Great performances came from Fauquier Freshman Garrett Tingen at 126 who won with a last second reversal to capture a 2-1 win over senior Caleb Yost from Kettle Run. Both Garrett and Caleb are both ranked in the state as we expect them to face each other again next week. 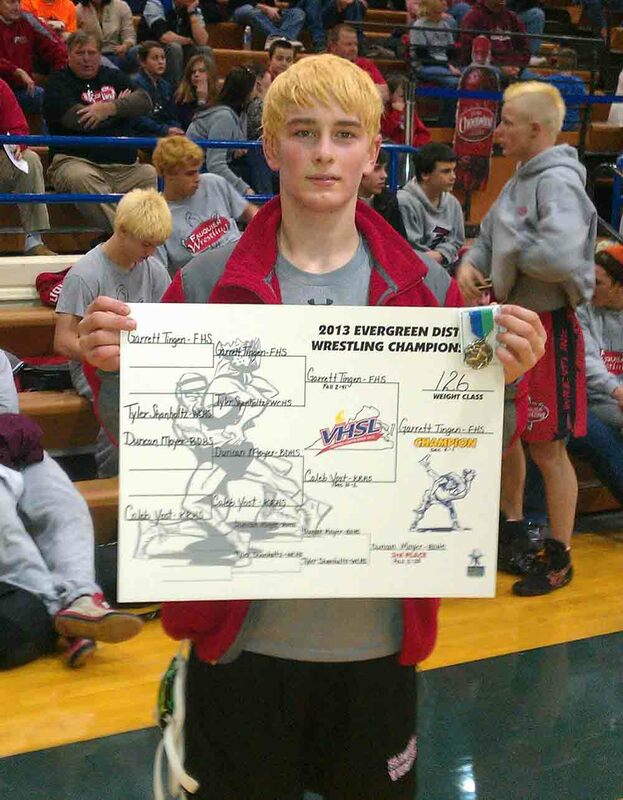 Fauquier Sophomore Matt Raines at 132 also won a thriller match with a 7-3 win over Justice Jacobs from Brentsville. Matt was down 2-3 during the third period but he was able to reverse and turn Justice to his back holding him there the last 25 seconds of the match for the win. Both of these wrestlers faced each other twice during the season and also are certain to square off with each other again at Regionals. Both Matt and Justice are also ranked high in the state standings. 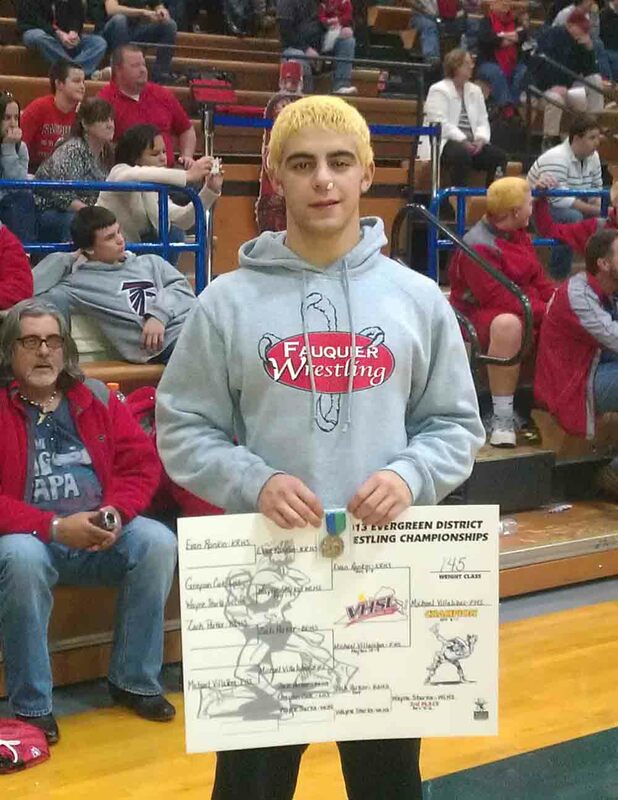 Fauquier Senior Michael Villalobos at 145 was the third Falcon to win districts with a 6-1 match over Evan Rankin from Kettle Run. Michael controlled the entire match earning points from take downs and a reversal. To be in the stands at Liberty HS. on Saturday night and to witness such drama that unfolded in front of all one can say that this is how every district tournament should finish-up; to win the district tournament it must be decided on the very last match of the evening. All eyes were on the 285lb final match as Fauquier’s Justin Sanker and Todd Parker of Liberty stepped on the mat to square off as the Fauquier, Brentsville, and even Liberty fans waited in anxious suspense. But the time the finals got to the 285 match a Sanker win would give Fauquier the district title and if Parker wins as he did Brentsville would capture the district title. As the team moves forward to the Region II tournament next weekend you have to believe that each match that every wrestler has will be that much more difficult than any district match. The regional tournament will bring in three other districts to be pre-seeded in a 16 man bracket. The Falcons have been training all season and all year long for the 2013 High School wrestling post season to arrive. To be in it Coach Fisher will now have to redirect and refocus the team towards the Regional tournament which will be at John Champe High next Friday and Saturday February 8th and 9th. Below are the results of Fauquier Falcons at the Evergreen District Tournament. Fauquier takes a 2nd place finish at Districts. Round notes: Fauquier went 3-5 with 161 team points. 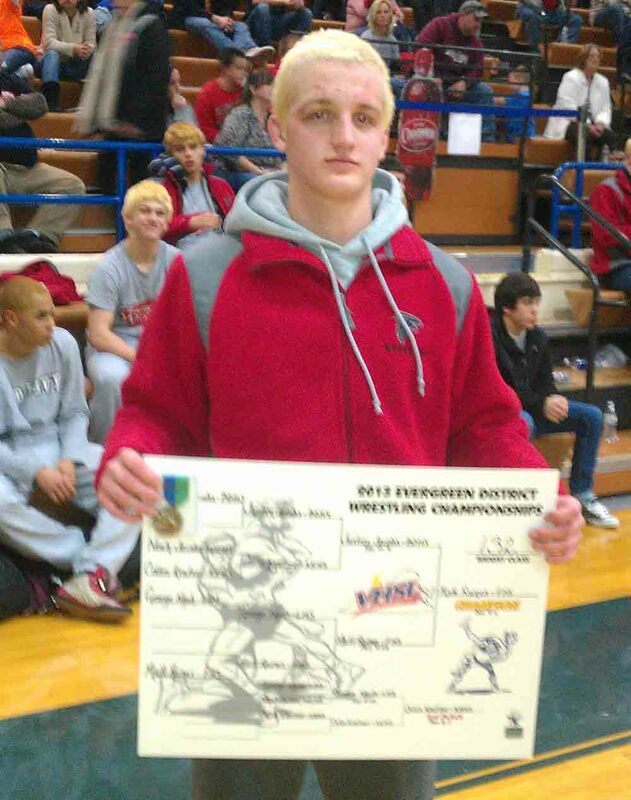 120 Jake Hilleary lost 4-2 to Levi Lambert-Warren Co. Round notes: Fauquier went 3-1 with 1 pin. Round notes: Fauquier went 3-2. 106 Caleb Strum lost 6-0 to Tyler Bariciano-Warren Co.
126 Garrett Tingen won by pin over Tyler Shanholtz-Warren Co.
152 Andrew Smith lost by pin to Jacob Schneider-Warren Co.
170 Erick Lemus lost by pin to Dillon Kidd-Warren Co. Round notes: Fauquier went 8-4 with 4 pins. Fauquier has 105.5 pts. Round notes: Fauquier went 0-2.